Shop Marine Products online at Marine-Products.com for wakeboards & bindings, waterskis & bindings, boat parts, marine hardware & electronics, kneeboards, wetsuits, tubes & inflatables and much much more. Save on your next purchase from Marine-Products.com with discounts, coupons, promotions and savings from 58coupons.com. Enjoy free shipping on orders over $99 from Marine-Products.com. Click link to start shopping. Hurry on over to Marine Products and save up to 70% on closeout items. Click link to start saving. Head on over to Marine Products to save up to 20% on parts. Click link to view. Get a Free Board Bag with purchase of any 2010 board deck or package of $339 and up! Click link for details. Check out the water inflatables from Marine-Products.com and save up to 10% or more. 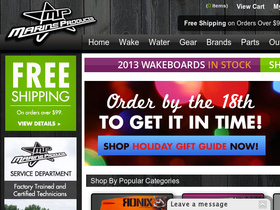 Hurry on over to Marine-Products.com to save up to 20% on wakeboards.